Recently, Google announced changes to their search results, incorporating Google+ Circles social data into an individual’s results, there have been many reactions and conversations about this new product “Search plus Your World”. However you view this move good bad or just confusing, it is the start of the change and merging of search and social data and it is just the beginning. From a business perspective this is changing the game significantly and where a number of successful online businesses who have built their online business and revenue model based on an SEO strategy and played lip service to social, if they have not seen an impact on their bottom line, yet they will do so unless they acknowledge that the world is changing and SEO is no longer dominant and that the future is a combined strategy, with specialists in both areas, working towards the same goals. 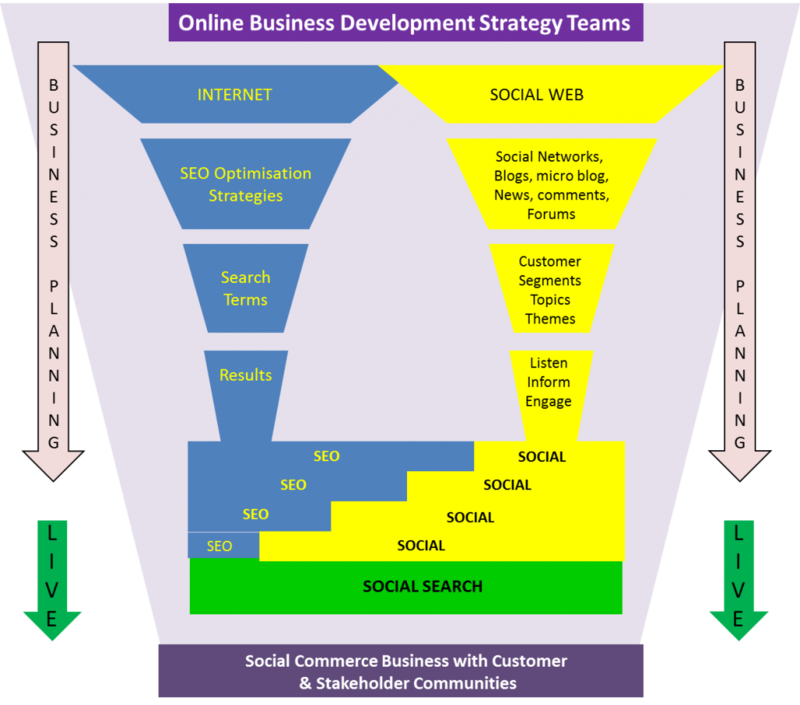 In the diagram below, we show the 2 current silos and the way we envisage the Social Commerce Model to evolve with SEO, social data funnels merging to support the businesses goals. As more organisations and their business partners look to develop social strategies in one or more areas of their business, the need for cases studies is increasing. We have compiled a selection of social business cases studies, which show the business value from an individual social media campaign, to customer service, social commerce, evolving business models and developing a new business model with social at the heart of the strategy. This is not an exhaustive list, but it does demonstrate that social both in discrete projects or areas of the business, to disrupting business models. If you have other business cases, you can point us to please drop us a line or comment below. View more presentations from julie walker. Social business strategies are adding value to companies across all industries today, but we are in the infancy of this area of business and as we see more successes, then we will see the evolution of the framework and also more experienced and skilled professionals leading and managing these projects. Today, it is still a bit of trial and error, but if you dont try you dont learn anything! Have just watched this video from becky brown, social media director at Intel, where she discusses their current centralised social media strategy, tools platforms and their journey to their position today. Intel has been developing their use of social media channels for a couple of years and understands that the majority, 80%, of the conversations around their brand and products take place on blogs and twitter. However there was a growing use of Facebook within the business which at 250 individually created and managed pages, it was difficult to co-ordinate and manage multi market campaigns. complemented by a suite of publishing Vitrue, listening, Radian6, & internal reporting tools. This centralised strategy allows them to listen and respond globally, locally or to individuals, based on the context of the conversation. Intel also use, a global community of brand ambassadors, who are identified as influencers, either throgh their online activity around the intel brand and/or range of products and are invited to join an intelambassadors program, where they are given pre-launch info about products and encourgaed to blog, comment and spread the word globally about Intel, their brand and products. This is the start of their emerging strategy and ince the facebook strategy is underway, the next challenge is the 350 Twitter accounts……. As a TRUSTED developed and engaged community Chevron can channel campaigns through the community to drive traffic back to websites, surveys, other conversations on other channels. To hear the full presentation and view the slides, click on the video below and review the slides at the bottom. Social media expert or a business/marketing/PR strategist who knows how to utilise these tools? A topic I have had discussions about quite a lot over the last few months is about the number of social media experts in the market today, many of whom have been involved in one initiative for 6 months – but they are an expert. There are many people who have been creating, managing, moderating and extracting value from online communites/social tools in their various forms since 1970, so it is hard to acknowledge an “expert” with such little experience. So how do customers/clients/individuals find someone who can help them unravel all this “stuff” and help them add value to their business? So, my point is that each of these groups are informed and educated, engaged and collaborated with, listened to, provided a level of service/support and each of these activities are a form of communication which can be one or two way or involve multiple groups in multiple directions. Underneath all this communication is social media/social tools/digital tools/online communities and there are pockets, albeit small pockets of deep knowledge in some of these areas but not all areas but because the marketers of this world – whose job it is to AMPLIFY messages to the audience whoever they are have grabbed on to these terms and are trying to get to grips with how to incorporate them into their marketing strategies and tactical campaigns for their clients – they ALL NEED to be experts and gurus as they are only as good as their last campaign success so they are making a lot of noise. Last year I did some work with a brand strategy agency and they had identified over 75 communication channels for a frozen food brand – about 10 of these could utilise social tools – I am sure there are more this year. So, what is my real my point or may be a hope – that social media/social tools/digital tools/online communities stop being the latest news on the web and the “social media guru” stops being a claim on lots of CV’s and that they become the underlying mechanism for an organisation to communicate with any or all of their stakeholder groups and that they can obtain value from this which allows it to continue to grow and provide value to each and all the stakeholders involved. The bottom line is that some of today’s tools will become standard tools, some will be obsorbed into others, some will fade and go away – however businesses will continue to function and other tools will appear which add value – it is key to understand how businesses operate and the role which you are supporting within that business with the technological tools set, not the tools themselves. Passionate about online communities, customer centric business growth strategies and innovation. This is my personal website, where I share my thoughts and views of the online socially connected world. Employee Customer Conversation Matrix – Where are you engaged? Can Shaq Save the Papa John’s Brand?